Did you know that only 2% of Americans will retire with financial independence? With increases in life expectancy, today’s adults will live on average 17 additional years into retirement. Financial security in retirement is a major concern of today’s population with a large majority of Americans lacking in education about all of their options. We are an Ohio based Real Estate Company that buys homes across the state of Ohio with our primary markets being Cincinnati and Dayton. Our passion lies in providing a hassle free home buying process to fellow investors like ourselves. What is the best strategy to replace your current income and what type of Investor are you? These are potential investors who want to be involved in the entire process from beginning to end. While we can relate to this type of investor, it has taken us years and hundreds of thousands of dollars to gain all the experience and knowledge we have today. If this is YOU, we recommend that you find a successful investor in your local area so you can be hands on and dedicate the time required to become a professional investor. These are potential investors who have careers and/or families and other obligations. You understand the power of building wealth through real estate… you want to have hassle free passive income… but you don’t have the time to figure it all out or do it all yourself. This is the type of investor we have a passion to serve. We help investors avoid making all the mistakes we made when we got started. We also teach them not to invest based on “hope” or “speculation” and understand the importance of investing in the right locations for INCOME which is what provides true financial freedom. If this is YOU, please contact us. We’d love to help you reach your goals! We are a large group of industry veterans that includes Licensed GCs, RE Agents, Brokers and REO Specialists. Our primary office in Ohio is headed by Dani Lynn and Flip Robison. In addition to our in house team whom you can meet by clicking the link below, we have project managers, realtors and additional team/crew members we rely on for acquisition services, property inspections, professional service, repairs, rehab, and all licensed trades. 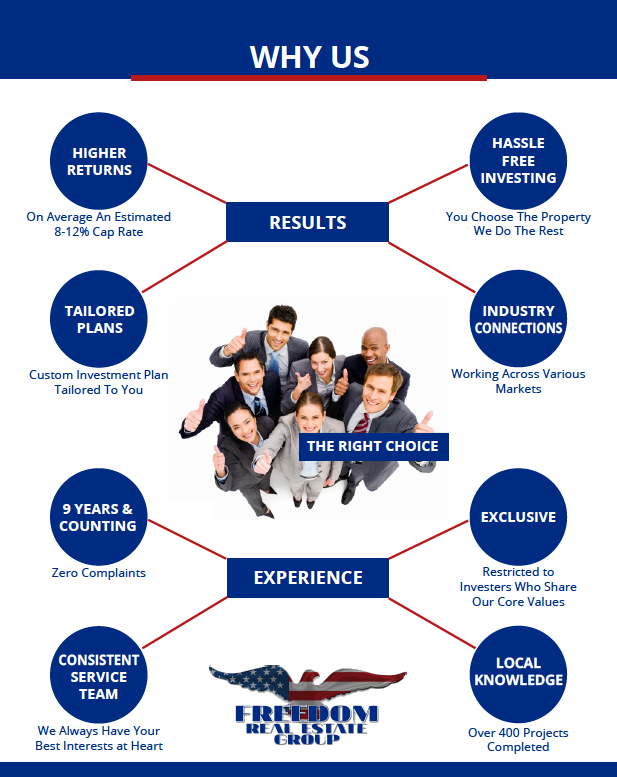 Click Here to Meet the Invest In Turnkey Team.